Though I am free and belong to no one, I have made myself a slave to everyone, to win as many as possible...I have become all things to all people so that by all possible means I might save some. I was a rebel, and the nice lady at church was just concerned about me. This was about 1984 or ‘85, and the life choice I had made pushed firmly against the way things were and the way things were done at the mostly white, suburban, upper-middle-class church I had been a part of for most of my life. I was baptized there, was involved in the youth group, and beginning to – mostly – take my faith seriously. But what I had done threatened to compromise all of that. This lady saw it and was only trying to spare me from the dire consequences of my backsliding. That’s why she wrote the letter. Her tone was earnest. Her words obviously chosen carefully. She made it clear that her concern came out of love for me and my family and a desire to see me make the changes in my life I needed to make. But she was unequivocal and bold about telling me what those changes were. I was compromising my faith and my standards, not to mention bringing disrepute upon the church and being a bad example to others. The earring had to go. I started thinking about that letter because of a new survey done by Lifeway Research that has some interesting things to say about young adults and church. The study is a follow-up to one released in 2007. In both, young adults who had attended church regularly in high school were asked if they had stopped attending for at least a year between the ages of 18 and 22. In 2007, 70% stopped for a year. In the study released this year, 66% had stopped. In both studies, those who said they had stopped attending were asked to choose from a list of reasons why they stopped – as many as they wanted. The top reason chosen was simply the fact of moving away from home (34%). But almost as significant statistically were the reasons chosen second through fourth most often. They were, in order: “Church members seemed judgmental or hypocritical” (32%), “I didn’t feel connected to people in my church” (29%), and “I disagreed with the church’s stance on political/social issues” (25%). In short, three of the top four reasons young adults stopped attending church had to do with their perceptions of the people at church around them. The reasons people have from walking away from church always have been and I guess always will be hard to pin down. But it’s kind of undeniable that the way the believers in the pews around them treated them, or their perceptions of that treatment, had a lot to do with why the young adults who responded to this survey walked away, at least for a while. Now, I seriously doubt that there are too many people at any church who have made it their life’s mission to run young adults out the door. But it’s clear that at least some young adults are perceiving that their churches are more interested in looking down on them and correcting them than they are in connecting with them and being their family in the faith. One way to respond to the data in this survey might be to resist the tendency to get defensive and start asking ourselves what young adults in church are seeing in our interactions with them. Paul talked about his missional mindset in extreme terms, didn’t he? I have made myself a slave to everyone. I have become all things to all people. He thought that way because to him the most important thing in any interaction with anyone was that he might win a hearing for the good news of Jesus. He had beliefs, opinions, and convictions. He had specific expectations for the way a person who’s walking with Jesus should live, and certainly was willing to spell those expectations out. But I read his statement about becoming all things to all people is to say that his first impulse was to start where people were and that getting a hearing for the gospel was more important than his own beliefs, opinions, convictions, and expectations. So why does it seem like the church sometimes loves its own way of doing worship more than it loves its young adults? Why does it seem like the church thinks its own political opinions are worth sacrificing a few of the next generation for? Why do we expect our young adults to just be quiet and do things like we’ve always done them instead of making ourselves slaves for them? Why do we expect them to look like us instead of becoming all things for them? What do young adults in our churches see in our social media posts? I saw one post recently from a Christian in higher education I know ridiculing college students as “snowflakes.” What ideas do you think young adults at his church might have gotten from that about his opinion of them? In our world, we need to think harder about the image even our most unguarded words and actions project. There is room for discussion and debate. There is room – and it’s indispensable – for older Christians to share their wisdom with younger. But the most important thing you can do for young adults in your church is to come alongside them and love them and welcome them and let them see you following in the steps of Jesus. That lady in 1984 didn’t push me away from church, even for a little while. 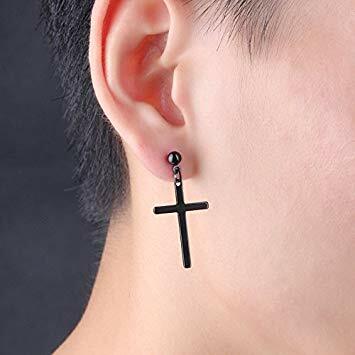 (I believe my mom did have some words with her…) But that’s largely because I knew that I was loved and welcomed and appreciated there – even though a lot of folks probably thought like her about the earring. But what damage can be done by adults who think our opinions should be gospel and our conclusions accepted without debate. How we can hinder the first faltering steps of faith. How we can discourage young believers who are still figuring out who they are and what following Jesus looks like for them. How badly we can hurt the church. How easily we can come between a young man or woman and their Lord. Even ear-pierced rebels can grow up in the Lord, if we’ll let them.